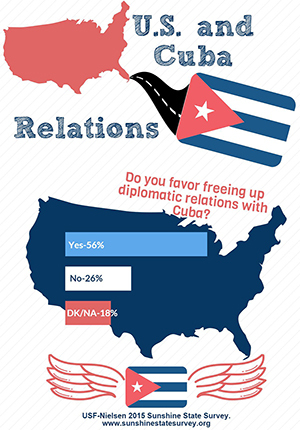 Infographic from the Media and Politics class at USF. TAMPA, Fla. -- For the second year in a row, students from the Media and Politics class at the University of South Florida worked on the annual USF-Nielsen Sunshine State Survey under the direction of Distinguished University Professor Susan MacManus. However, this year had a unique twist: students learned how to take the survey data and turn it into infographics. Infographics are a visual representation of information, data or knowledge intended to present information quickly and clearly. This opportunity proved to be a valuable experience for College of Arts and Sciences students. After Nielsen collected the survey data for the 2015 survey, a handful of students worked with MacManus during the summer to create compelling infographics using a program called Piktochart. MacManus said the sharp rise in social media and the emergence of a more visually attentive public has necessitated the use of infographics in the distribution of survey results. Georgia Pevy, who took the Media and Politics class in spring 2015, said she was grateful for the opportunity to work on the USF-Nielsen Sunshine State Survey in class, but also as a member of MacManus's summer research team that developed infographics. "Learning to create infographics was exciting to me because infographics are the new way to communicate data in a quick and efficient way, and is a very marketable skill in today's job market," Pevy said. Pevy also said infographics are important because more people are receiving their news and information on the Internet. "People's attention spans are getting shorter and shorter, and infographics are key to catching people's interest and communicating large amounts of information in a small amount of time," Pevy said. "They can also get people to go find out more about the subject." Jacqueline Gomez, who is double majoring in political science and mass communications, said it was refreshing to work on the infographics, allowing her to tap into her creative side. "Having infographics in my portfolio is going to be useful for when I need to show my diversity in the creative field," said Gomez, who also was part of the summer research team. "I want to show that I can do more than just write." Gomez, who took the Media and Politics class in spring 2014, said she is appreciative of the opportunity to work with MacManus on the survey. "I admire how much passion she has in teaching," Gomez said. "I've never had a professor who cares about my future so much." Pevy said the summer she spent working with MacManus was very positive. "Dr. MacManus is wonderful to work with," Pevy said. "She offers lots of encouragement and helpful feedback, and is always looking for ways to teach us more about the survey." Much like her students, MacManus also has had a positive experience working on the USF-Nielsen Sunshine State Survey. "The USF-Nielsen partnership on the Sunshine State Survey has provided me the opportunity to engage in new forms of teaching that are very rewarding," MacManus said. "Student reactions to this unique learning experience remind me of why I decided to become a professor so many years ago. Equally important is the final product--the Sunshine State Survey--which makes available timely and reputable data to utilize in teaching and in public presentations." The USF-Nielsen Sunshine State Survey is the most anticipated annual survey of Floridians on a wide range of issues affecting the state of Florida and serves as our state leaders' report card. 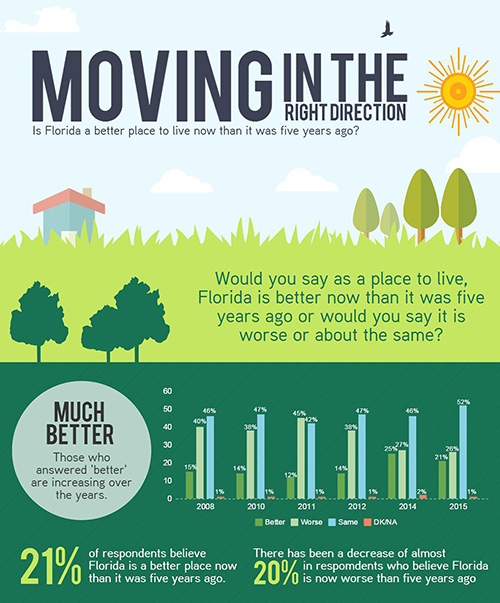 Conducted by the College of Arts and Sciences at the University of South Florida and Nielsen, this survey has become a critical source of citizen opinions on key issues facing this rapidly changing state--the nation's third largest. The series of questions asked annually since 2006 provides leaders and academics in the public, private and nonprofit sectors with much-needed trend line data, while questions on newly-emerging issues give leaders an invaluable baseline look at where a wide cross-section of our state's residents stand on them.